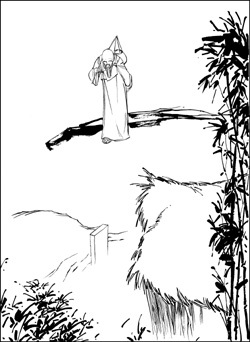 He waited till a little past ten and saw a monk wearing a tattered robe and carrying a stick with a bundle attached that held his clothing and bedding. 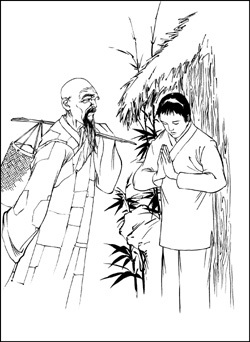 The monk put down his bundle and spoke to him. Now, Filial Son Wong wasn't talking, but he mentally asked the monk, "Where did you come from?" He spoke with his mind, not his mouth. The monk answered, saying, "I come from Mount Guangning." name? What are you called?" The monk replied, "My name? Well, are you familiar with the Ming Dynasty? I was a general during the Ming Dynasty. Later, I left home and started cultivating the Way. Recently, I have felt that I have some affinities with you, so I have come here today to see you." He also said, "I know you are thinking of going to Mount Guangning to cultivate. That is a place for people who only take care of their own virtue in solitude. As for you, you should take care of the whole world. Your affinity with people in this place is very strong. Don't go to Mount Guangning. After you finish your period of filial mourning, stay here and build a monastery. It would be best to propagate the Buddhadharma here." After saying those few sentences to Filial Son Wong, the monk left. That monk claimed that he was from the Ming Dynasty. How can we prove what he said was true? The fact that he knew the question asked in Filial Son Wong's mind proved that he was a person who had already attained the penetration of knowing others' thoughts--a state associated with the Five Eyes and Six Spiritual Powers. However, Filial Son Wong lived during the Republic, about three hundred years after the Ming Dynasty. Over three hundred years had passed, and yet this monk was still alive and came to visit Filial Son Wong. This incident proves that the claim that someone saw Patriarch Bodhidharma in India a few hundred years after he entered the stillness, and that the situation described by Fang Bian regarding the transmission of the sash, are not that unusual. Those incidences were, in fact, rather ordinary occurrences; not all that strange. The inconceivable states of Patriarch Bodhidharma will never be forgotten. The Chinese people will forever remember Patriarch Bodhidharma.